This sculpture was originally part of the tomb of Philip the Bold, who was the ruler of the Netherlands and regent of France until his death in 1404. Forty mourning figures, called pleurants, form a procession around the base of the tomb. Each is placed in an arcade characterized by gothic architectural forms. The gisants, or funerary statues, of the Duke and his wife rest on top of the tomb. The tomb of Philip the Bold, originally in the Carthusian monastery of Champmol at Dijon, France, was destroyed in the French Revolution. Many of the surviving fragments, including the top of this arcade, were salvaged and then sold to collectors. 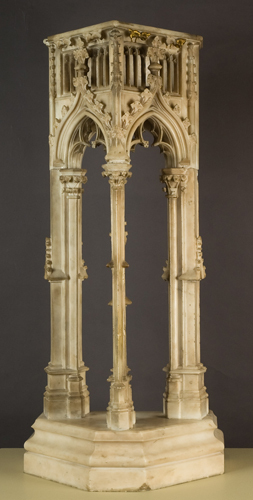 The tomb was extensively restored from 1818 to 1823 and now stands in the Museum of Fine Arts in Dijon.